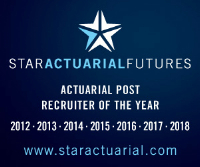 Our client requires a part qualified property pricing actuary to work in their pricing team in London. The new person will be in a team of 4, and report directly to the head of pricing, who has a long history in the Lloyd's and London Market, and will be an excellent mentor. The team currently has a qualified actuary and a graduate, and is looking to fill the gap. The successful candidate will have between 3 and 4 years' experience in pricing, and experience in property pricing will be an advantage. This is an excellent opportunity for someone looking to develop and progress in a career in the Lloyd's market.